This spring, a group of inmates at a privately operated federal prison in Mississippi -- most of them undocumented immigrants from Mexico -- rose up against their guards, setting fires, taking hostages and ultimately killing one correctional officer. The riot, the latest in a string of uprisings at low-security private prisons housing undocumented immigrants, came after complaints from prisoners about "substandard food, medical conditions and disrespectful staff members," according to a federal court affidavit filed by the FBI. The inmates incarcerated in the Mississippi prison and more than a dozen private facilities across the country are not awaiting deportation in the immigrant detention system. Instead, many are serving prison time for the crime of crossing the border, a federal offense that prosecutors are filing in record numbers as part of a government crackdown on illegal immigration. For three years in a row, more people have been convicted of immigration offenses than of any other type of federal crime, according to the United States Sentencing Commission. Illegal re-entry into the United States was the most commonly filed federal charge last year, marking a dramatic shift in the makeup of the U.S. criminal justice system, which has been dominated by drug crimes in recent decades. As a surge of new immigration offenders flow into the federal prison system, they are being held primarily in private prisons operated by multibillion-dollar corporations that contract with the government. Federal prison officials argue that privatization saves money and frees up space for more violent criminals in government-run prisons. But critics contend that the expanding web of privatized prisons for undocumented immigrants is substandard, where prisoner uprisings have become common due to poor conditions and inadequate medical care. "These are basically second-class prisoners," said Judith Greene, the director of Justice Strategies, who has researched the rise of private prisons over nearly three decades and recently wrote a report on federal prisons for undocumented immigrants. "They're hiring cheap labor, and they're not putting dollars into the things that keep prisoners relatively content: medical care and food." "We call upon you to redirect funding from the wasteful prosecution and incarceration of low-level immigration violations and focus resources instead on correctional programs that will better prepare federal prisoners for constructive lives when they are released," read the letter. Representatives for the private prison industry argue that they are providing an essential service to taxpayers as state and federal budgets are tightening. Steve Owen, a spokesman for Corrections Corporation of America, which operates the Mississippi prison where a riot erupted in May, questioned why advocacy groups "would spend so much time, effort and money attacking a company that provides such a vital public service by housing inmates safely and humanely at a savings to taxpayers." A spokesman for the GEO Group Inc., another major for-profit prison operator, wrote in a statement: "All correctional, detention and residential facilities in the world, public or private, face operational challenges that are inherent in the management of offender and mental health populations." He added that the company has "a commitment to providing high-quality services and adhering to industry-leading standards." But a series of academic reports, including studies performed by Federal Bureau of Prisons researchers, have found minimal cost savings at private prisons. Other reports have found that conditions inside private federal prisons are comparatively worse than in government-run facilities, with more overall prisoner misconduct occurring inside private prisons. Beginning in 1999, the Federal Bureau of Prisons began looking to the private sector to run facilities housing so-called criminal aliens, or non-citizens serving time for federal crimes. 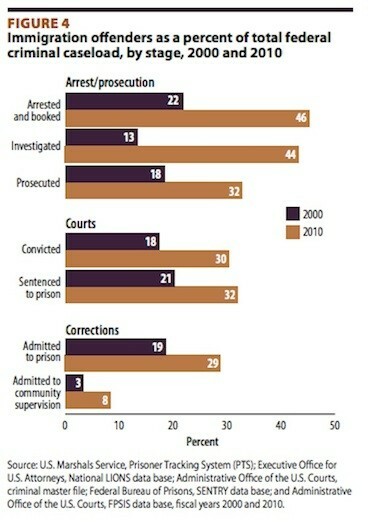 Over the years, the Bureau of Prisons has provided a steady source of revenue to private prison companies. Corrections Corporation of America took in $205 million from Bureau of Prisons contracts at the end of 2011, up from $132 million at the end of 2002, according to company financial statements. The GEO Group took in $258 million from federal prison contracts at the end of 2011, up from $64 million at the end of 2004, according to securities filings. The growth has come after a slate of new border security initiatives over the past decade. In 2005, the Bush administration started a program called "Operation Streamline" along the border in Texas. The plan was aimed at arresting and prosecuting those found crossing the border, instead of simply deporting them or placing them in the traditional civil immigration detention system. Offenders were charged with misdemeanors for illegal entry, or felonies for re-entering the country after a past deportation. The average sentence for illegal re-entry is between one and two years, though those convicted of the crime can be held up to 10 years if the offender has a criminal history in the U.S., according to a recent report from Grassroots Leadership, a criminal justice advocacy group. For private prisons, according to the group's report, "The threat of a 100 percent criminal referral rate at the border presents an enormous opportunity to expand." 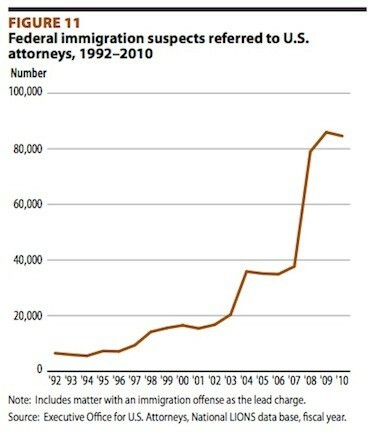 Federal immigration arrests have doubled since 2005, and the number of criminal immigration suspects referred to U.S. attorneys' offices has jumped from fewer than 40,000 in 2006 to more than 84,000 in 2010, according to a Bureau of Justice Statistics report released this summer. The number of immigration convictions has now surpassed drug convictions. In 2001, only about 18 percent of federal criminal offenders were sentenced for immigration-related crimes, whereas more than 41 percent were sentenced for drug crimes. Over the past decade those numbers have flipped: Now 34 percent of all offenders are sentenced for immigration-related crimes, whereas drug crimes make up only 29 percent of cases, according to reports from the United States Sentencing Commission. "This is like the War on Drugs, part two," said Alexis Mazon, a researcher with Justice Strategies. Critics of the federal immigrant prison expansion say that a series of uprisings -- including the deadly May riot at CCA's Natchez, Miss., facility -- point to problematic conditions inside prisons housing mostly nonviolent offenders. There have been at least five major disturbances in the last five years at privately run, low-security facilities for immigrants, many of which are in Texas. Two riots in the span of a month rocked the Reeves County Detention Center in the desert of west Texas in late 2008 and early 2009, after a series of suicides and inmate deaths. During the first riot, in December 2008, inmates at the prison managed by the GEO Group Inc. set fires and armed themselves with hammers, box cutters and horseshoes they found in the recreation building. According to police reports obtained by the Texas Observer, they demanded a meeting with the Mexican consulate, the warden and the FBI after seeing a fellow prisoner carried out in a body bag -- an epileptic man named Jesus Manuel Galindo, who had been left alone for weeks in isolation despite repeated pleas for medical attention. Galindo had more than a half-dozen seizures over the course of six months in 2008, and he continually asked doctors to put him on a different medication that had controlled his condition in the past, according to a lawsuit filed by the American Civil Liberties Union. In a note to prison medical officials months before his death, Galindo had sounded desperate alarms: "My mouth and [tongue] hurt from falling on my face ... Please help me before something really bad happens." In November 2008, prison officials placed him in isolation as a form of discipline, saying he wasn't taking the medication as instructed, according to the lawsuit. He suffered more seizures while alone in his cell, often waking up bleeding from falls. And on the morning of Dec. 12, 2008, guards found him dead, with blood dried around his mouth and nose. Paez, a GEO spokesman, said the company cannot comment on specific inmate incidents, saying only that "all incidents are thoroughly reviewed by our client, law enforcement and our company." Families of inmates at the Adams County Correctional Center in Mississippi, where the May riot occurred, also complained of inadequate medical care. Last fall, Juan Villanueva-Vasquez was complaining of a nagging cough to nurses inside the prison, according to his sister, Angelica Moreno, who lives in Los Angeles. Moreno said her brother, sentenced to three years for illegally re-entering the country, was examined several times late last year. Prison medical officials told him it was the flu. But the cough persisted, keeping him up at night, and he continued to ask for a second opinion. Months later, he was coughing up blood, Moreno said. Eventually, in March, prison staff took him to an outside hospital, where doctors diagnosed him with lung cancer after doing an X-ray. His condition worsened, and he died in July at a federal prison hospital in North Carolina. "They should have done the X-ray in the beginning," Moreno said. "My brother could still be alive." Owen, the CCA spokesman, wrote in a statement that the company cannot comment on individual medical cases, but continued, "Our dedicated and professional team is firmly committed to the health and safety of the inmates entrusted to our care."